Just on a lazy Sunday, as I had nothing to be engaged with, took out my point and shoot camera and clicked this hill-top view from the bedroom of my elder sister’s in-law’s apartment. Grandma Steps Into Her 100th Year Today! My Aita (Maternal Grandma) Saraswati Kakoti(née Rajkhowa) is celebrating her 100th Birthday today…. Aita is an awesome, intelligent, courageous and a beautiful woman of 99! She was born in the year 1914(the year of the First World War) in Dibrugarh town(Assam, India). She is the great grandchild of Maniram Dewan, who was one of the first people to establish tea gardens in Assam. Aita passed her high school in 1931 from Dibrugarh Girls’ High School which was then affiliated to Calcutta University, with first division marks. She then went on to pursue her higher studies in Dhaka(then it was part of India). However, she could not complete her studies due to some difficult family circumstances. As she could not complete her education, she went to Dhubri and worked as a teacher for the Assamese subject in Dhubri Girls’ High School. Infact, she was the very first teacher to teach “Assamese” ever in Dhubri (majority of people in Dhubri are Bengali). In 1938, she married Advocate Indranath Kakoti and moved to Tezpur where Koka(Grandpa) was working, to start her conjugal life. But after few years, they came to Sivasagar(grandpa’s hometown) and got settled in the Phukan Nagar area. She was the secretary of Mahila Samiti (Women’s Forum) and was an active member who encouraged self-employment of village women. Maa said that they used to have “Taat Xaal“(handlooms) at their home in Sivasagar where women used to come and weave till dawn, and their neighbours used to wake up with the sound of the loom. She also used to go to a village nearby to teach in a school where people were mostly illiterate and her students ranged from the little kids to the old. In 1950, when the two natural disasters- first earthquake(magnitude of 8.7) immediately followed by flood, had hit Assam, she was among the people who helped the needy in the affected areas of Assam(this massive disaster in Assam took away many lives and properties) and also her group of women supplied knitted clothes to the Indian “jawaans” during the Indo-China War. These deeds indeed make me feel proud of her so much!! Undoubtedly, she was a very hardworking woman, and used to knit many pretty clothes, stitch many embroidered table clothes, et cetera and also used to prepare mouth-watering pickles… her Jolphai(Olive) and Aamor(Mango) aachar(pickle) were my favorites (I can say, these are the qualities which my mom and her siblings have inherited from her). Aita craves for sweets even now especially rosogolla and “Uphsos” (this is a sweet which is prepared only in Sivasagar- I am sure all the Sivasagarians can relate to this) and also “Bilahir Ambol” (Tomato-jaggery chutney). I still remember my childhood days with her. As I was a tall and a lean kid, she always used to say, “Besikoi bhat kha!“(“Eat more rice!”) and “Raj-haar daal sidhaa kori khuj kaadh!” (“Straighten up the spine and walk!”). Actually she was afraid that my spine would bend like those bamboo trees which were there in plenty in her backyard. She is the one who also taught me many English rhymes and Mathematics, played “BrainVita” and also used to reward us with cash prize whenever we used to secure any of the first 3 ranks in our final exams in school. Today, she is on her way to put one more step forward to hit Century! She is a woman of dignity who has been there, done that and seen it all…. Love the mild peach color of the sky…..
We are in the same boat brother…. 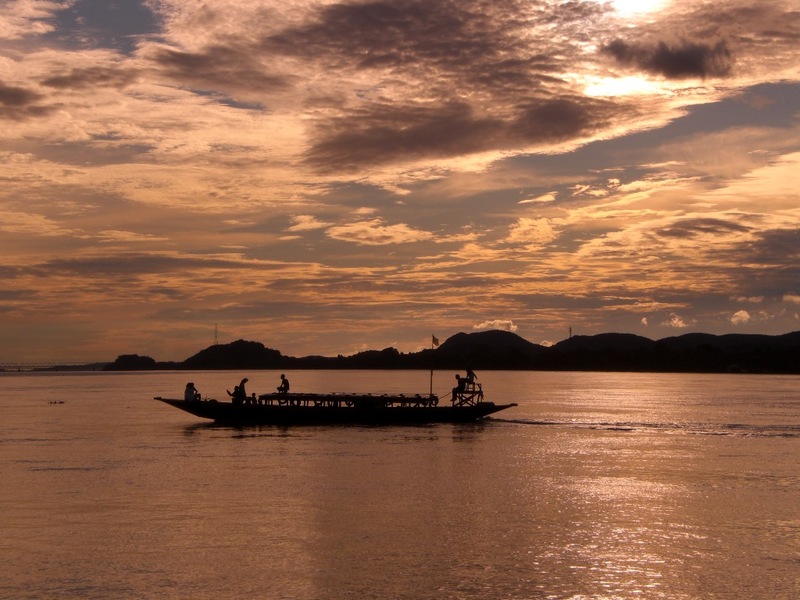 This photo was shot in Guwahati from a ferry.